Matt Berninger of The National and film composer Stephan Altman contributed “All I Want” to the soundtrack of the documentary American Chaos, and then they conceived of a second version, with Julien Baker joining on vocals. They performed the collaboration in LA earlier this month, and now the studio version is out as well; it’s the first part of Volume 2 of the 7″ For Planned Parenthood charity vinyl series. The B side of the single is a spoken word piece from Hanif Abdurraqib, and you can purchase it (as well as volume 1 of the series) here. California’s The Growlers just released new single “Who Love’s the Scum?” that’s out today on blue vinyl. While the title tips its hat to The Velvet Underground (“not everyone”), this is a Growlers track, garagey and poppy, through and through. UK band HÆLOS returned this year with new single “Buried in the Sand” — their first new music since their 2016 album, Full Circle. That song has now been remixed by Norwegian dance greats Lindstrøm & Prins Thomas who retrofit a new beat, boost the atmosphere, and extend the chassis, remodeling the song into a sleeker beast. 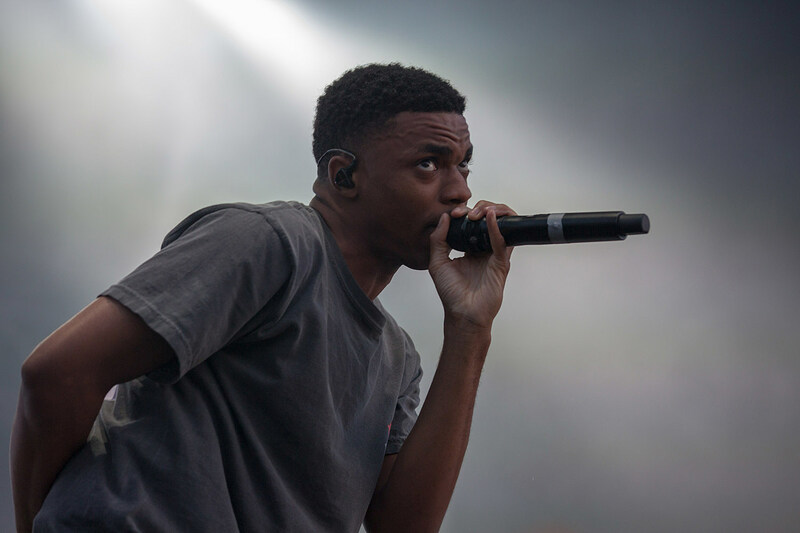 The soundtrack for the new animated Spider-Man movie Spider-Man: Into the Spider-Verse is out and, among other things, it features the new Vince Staples song “Home.” It’s a lot more bombastic than what Vince is normally known for, but it definitely sounds perfect for a superhero movie. There’s a new Adult Swim compilation out today called Fever Dreams, and among the 15 songs is this new glitchy art pop song from Alice Glass, “I Trusted You.” The compilation also features Com Truise, GosT, Carpenter Brut, Marie Davidson, S U R V I V E, and more. Stream the whole thing here. Kid Koala is releasing a second volume of his Music To Draw To series that, as the title suggests, is a soundtrack that doesn’t get in the way of your creativity. Much of the record features Trixie Whitley but this is one of the ambient instrumentals. Latin trap star Bad Bunny had a great year that included appearances on two of the year’s biggest hits (Cardi B’s “I Like It” and the “Te Boté” remix with Casper, Nio García, Darell, Nicky Jam, and Ozuna), and while he’s gearing up to release his debut album, he just dropped this new single “Solo De Mi.” It sees him sing-rapping over slowed-down Latin rhythms and a chilled-out atmosphere, and it’s good stuff. Chicago rapper Saba continues his weekly, post-Care For Me singles series with “Where It’s At.” This one sees Saba switching between super catchy sung hooks and mind-racing raps over swelling synths and rickety percussion. As far as his recent singles go, this is one of the most instantly satisfying. T-Pain, who just announced a tour, has also now released a new song. Though T-Pain has become an arguably even more exciting performer since his NPR Tiny Desk Concert showed off his knack for warm, belted soul songs, “That’s Yo Money” has him back in the auto-tune territory he scored hits with in the mid-2000s. NJ thrash vets Overkill are releasing their 19th album (and first with Shadows Fall’s Jason Bittner on drums), The Wings of War, on February 22 via Nuclear Blast. They’ve shared new single “Last Man Standing,” which is exactly the kind of thrash whiplash you’d expect from Overkill. All these years later, they still do this kinda thing super well. The Decemberists’ new EP of I’ll Be Your Girl outtakes, Traveling On, is out today (stream it and read our review). The whole thing is great but “I Will Not Say Your Name” is a real gem. It’s a nearly-seven-minute dose of psychedelic, slowcore-ish folk rock in the vein of Bonnie ‘Prince’ Billy or Songs:Ohia by way of Neil Young’s On the Beach. There’s a lot of this kind of stuff out there, but nobody sings like Colin Meloy, and hearing his uniquely appealing voice over this type of appealing music is a serious treat. Warish is a new band fronted by Riley Hawk (Tony’s son), and their first single “Fight” is a killer blend of stoner rock and garage punk. We wrote more about it here.